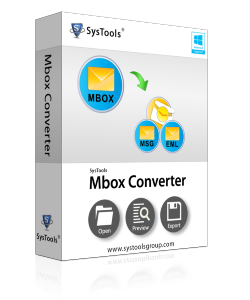 A superior MBOX to Outlook Converter Software to export emails from MBOX file to PST format with their associated attachments. This software is programmed with advanced features and functionalities. It is mainly, designed to convert MBOX file to Outlook PST without any hindrance. MBOX to PST converter software is prominently used to migrate, preview and save MBOX files to PST with their associated attachments instantly. This MBOX to PST converter software is a prominent one to perform conversion from MBOX to Outlook PST file format. It is an effective solution to migrate MBOX data to Outlook 2016, 2013, 2010, 2007. It makes the easy conversion from .mbox, .mbx and MBOX file without extension to Microsoft Outlook as well as EML, MSG, HTML. This MBOX to Outlook PST migrator software supports detection of MBOX file supporting all email clients. It facilitates an inbuilt feature to auto detect MBOX file from the default location. Instead of browsing the file yourself, you can choose the desired client and proceed with converting MBOX file through default profile configured option. The users are allowed to choose the MBOX file wants to be converted into PST file format. 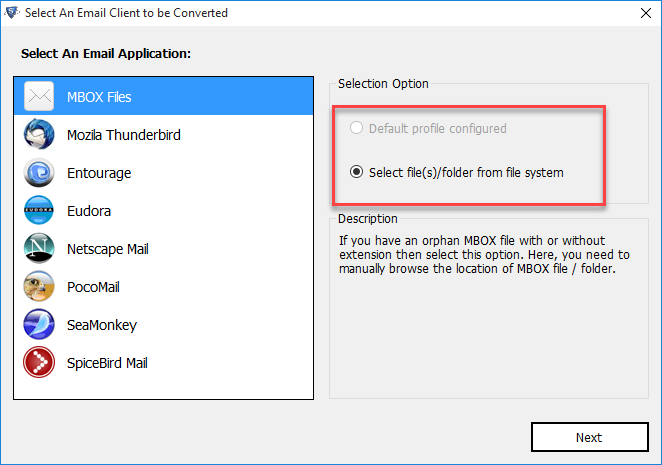 So, that the individual MBOX file or entire MBOX folder can be opted to export by a user. Moreover, Thunderbird MBOX to PST shows a complete preview of scanned files or folder with all email messages, contacts, tasks, notes and attachments. The review will appear in the 3D pane and give an option to choose file and mailbox in the left panel. This Thunderbird to Outlook PST converter is capable enough to filter MBOX from the assortment. 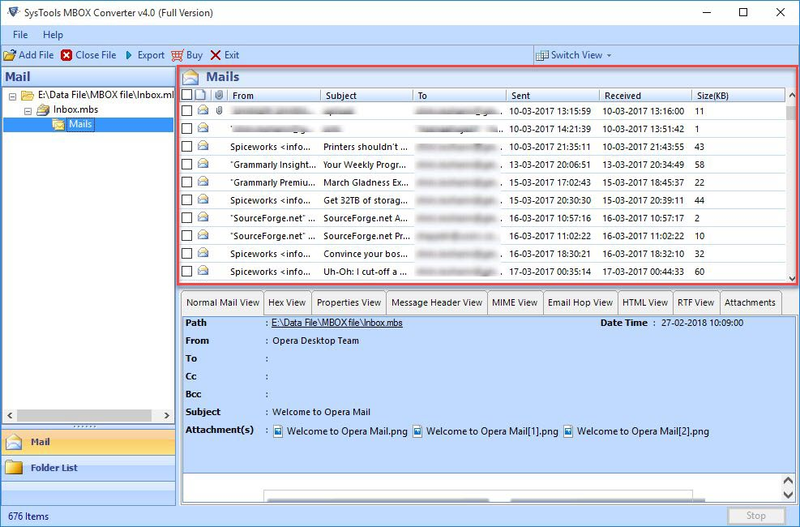 A user working with MBOX to Outlook Converter permits you to scan MBOX emails from even a folder saving other file types. The advanced algorithms associated in the tool make it able of sorting out MBOX files from multiple another file types and executing a selective file scanning. The tool works with advanced technique of file and folder selection to several file conversion. MBOX to PST migrator tool provides 2 options to either choose a folder or a single MBOX file. Users can simply convert multiple files with the select folder option. Additionally, it converts MBOX to Outlook PST file without any files size restrictions and data loss. Outlook program performance starts to degrade when handling large sized PST. This software facilitates an option to split large size PST. A user can split their resultant PST while exporting MBOX data. Using MBOX to PST converter application, a user can split their output PST file by size in GB and MB as per their desire and requirement. 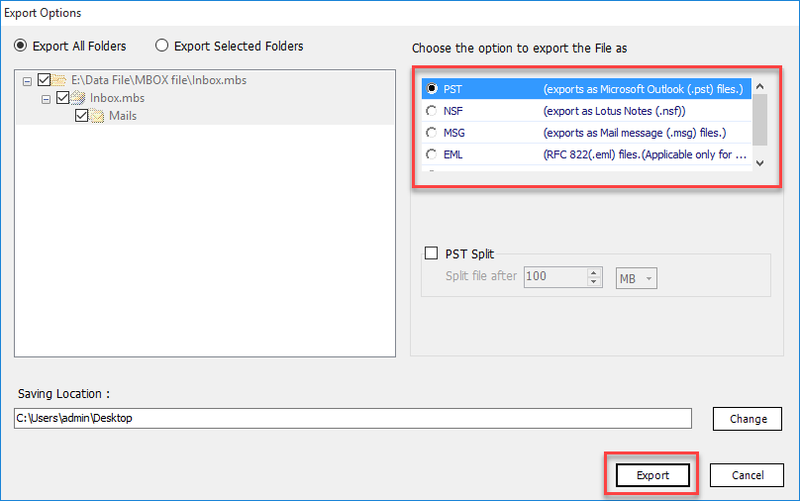 When migrating the MBOX file to Microsoft Outlook PST, this converter software provides two ways of creating the output file. The user can choose either “Create PST file per MBOX file” and “Single PST file for all MBOX files”. The software generates one PST for every MBOX file or a combined PST for all MBOX files. The software does not have dependency issues. There is no need to have Outlook installed/configured on the local machine even if the output is created in PST file format. Also, a user can convert MBOX to Outlook PST files format without the Outlook 2016, 2013, 2010, 2007 & 2003. Furthermore, it is also compatible with all advanced version of Windows operating systems also. Migrating emails from an another email client to Outlook is not an easy task. It is actually a difficult job to perform migration with data integrity and maintenance. Well, there is no inbuilt utility in Outlook, which opens or supports the MBOX file. Therefore, a perfect solution is required with which users does not face any hurdle or hassle while performing the conversion. Damaged Images or Pictures: After finishing up with conversion, graphics, photos, and other type of inserted images in email message display in a broken manner, when imported in Outlook. Sometimes, they are invisible in main content of email message. Chances to Loss Email Header: There are high chances of losing the original SMTP header part of email message, which might affect the actual data integrity of messages. Well, such email header data integrity issue is a serious problem for computer forensics. Long-term Conversion Procedure: The procedure to import MBOX file to PST is practically possible to perform with help of manual techniques but, the problem with them is that they consumes lot of time to accomplish task. This can utilize 1 hour, 1 day or even more. Instead of going for any manual approach to export MBOX to PST, the most appropriate approach is to look for a third-party utility i.e., Apple Mail MBOX to Outlook PST Converter. The software offers many astonishing features within it, which renders an error-free solution for end users. An ultimate feature provided with this software is that it supports batch file conversion, which means users can export multiple MBOX files collectively in Outlook. 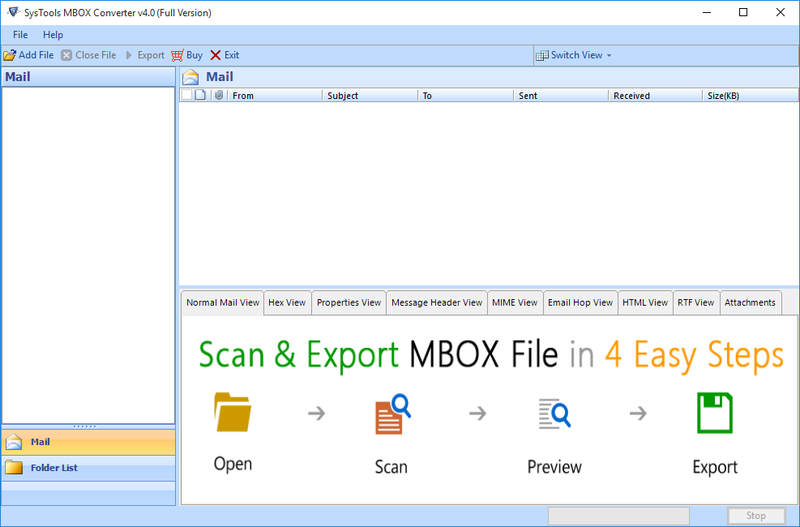 Trial version of MBOX to Outlook Converter view all the MBOX Emails & Export only first 25 items/folder to PST, EML, MSG, NSF. Does this migrator software convert MBOX files created by Eudora mail? Yes, of course, whether the MBOX files is generated by Eudora, Chaos Intellect, Pegasus Mail, or any other email client, our Apple Mail MBOX to Outlook PST Converter will support all type of MBOX files for the conversion. Does this MBOX to PST converter migrate multiple MBOX files to Outlook PST? Yes, the converter software is equipped with advanced techniques. That makes this utility reliable and superior to convert multiple MBOX files to PST file format. Can I convert MBOX to PST using demo version of the migrator tool? With the free demo version, you can convert the entire selected mailbox to an importable Outlook PST file. But, it exports only first 25 items/folder to PST. So, you can purchase the paid version of the utility to export and save the emails with all their attachments. Is there any file size restriction For conversion from MBOX to PST? No, there is no file size limitation for MBOX to Outlook PST file format migration. Also if the PST file size increases while conversion MBOX File to PST Outlook you have the option to split them. Can I convert my MBOX data file to NSF file format? Yes, of course, this software is capable enough to perform conversion between MBOX to Outlook PST effectively. Moreover, it also provides option to migrate MBOX to PST, NSF, MSG, EML, HTML formats. Does this software support Windows 8 and Outlook 2007? Yes, this MBOX to Outlook PST converter software is compatible with all versions of Windows Operating System and also supports all versions of Outlook program. I am actually glad to work with this MBOX file to PST Converter. One day I decided to switch my employees email servicing from Mozilla Thunderbird to Microsoft Outlook therefore, I took help of this FreeViewer product. It was so flawless conversion for me that I was able to export 40-45 MBOX files to Outlook with just few couple of clicks. It had became a nightmare for me to convert MBOX to PST with different manual tricks. One day my father recommended me to use this application and he talked a lot of impressive things about this tool. Therefore, I utilized the product and seriously without this tool, I cannot dream to finish up the conversion of emails from MBOX file to PST. I was searching for the software that can easily convert Apple Mial MBOX to Outlook PST format. I searched for the solution online that can perform the conversion without any data loss. One of my friends recommends me to use MBOX file to PST converter. I must say this software is very useful as it easily export mailbox folder to PST. Hi, thanks for the software as it really helps to convert Thunderbird MBOX to PST file format. This tool is very handy and works effectively. Special Thanks to the development team for creating such utility. Completely satisfied.!! I lost all my hopes to migrate Eudora Emails to MS Outlook 2016. I tried so many manual strategies to transfer MBOX files in Outlook application. However, it did not work properly. At last, I used this MBOX to PST converter and I can say it is the best to use software and everyone can opt this without thinking once. I want to say thanks to the development team who developed this amazing migrator software. This converter tool is so fast and reliable and it migrates my several MBOX files to PST within a few clicks. Apart from that, it contains a user-friendly and easy-to-use interface even, a non-technical user can also avail it. The MBOX File to PST Converter enables the user to convert the Gmail data in Outlook compatible format. Listed are the Outlook email client variants that you will be able to work with ones you convert the Gmail .mbox data.